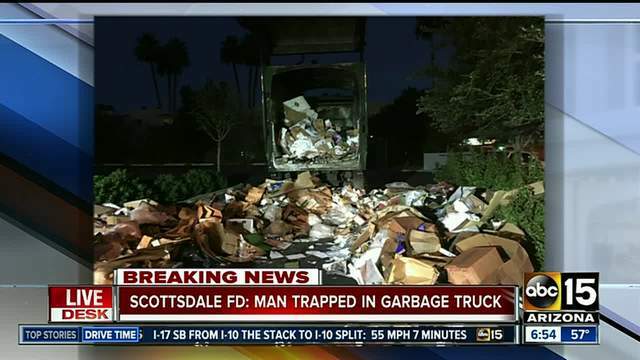 A man was taken to the hospital after he was dumped into a garbage truck in Scottsdale, Arizona early Thursday morning. Scottsdale Fire officials say the truck driver heard someone screaming, leading them to the man who had been trapped inside for more than 10 miles. The man was reportedly sleeping in a recycle bin when he was picked up and dumped into the back of the truck. According to police, the man was compacted twice inside the truck but cardboard boxes apparently saved his life. Crews rescued the man where the truck stopped in a parking lot. Fire officials say the man was taken to the hospital with a head injury, but did not disclose his condition.